The sandtiger shark (Carcharias taurus), also known as Grey nurse shark or Spotted ragged-tooth shark, can be found in most moderate seas throughout the World. 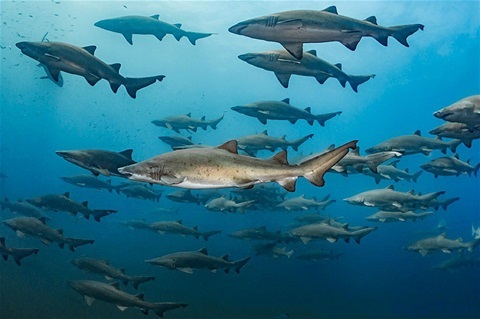 It is a typical social shark that congregates in smaller and larger groups above the sand, or prowls for bait in shipwrecks. Its ambiguous naming often leads to confusion. The sandtiger is not related to the tiger shark, nurse shark or the grey reef shark as the names above suggest. Picture left: Sandtigers in North Carolina. Picture taken by Tanya Houppermans. Phylogeny Sandtigers belong to the order of Lamniformes that are distinguished by eyes without nictitating membranes and a higher body temperature than the surrounding water. Many different families belong to the great order of Lamniformes. The tresher shark (Alopiidae), great white shark (Lamnidae) and mako shark (Isurus) are just some examples. The sandtiger belongs to the family of Odontaspididae, that splits up in two genera: Carcharias and Odontaspis. The sandtiger was originally named Odontaspis taurus, but later changed to its current official name Carcharias taurus. It is the only member of Carcharias, while Odontaspis contains two extant species: the smalltooth sand tiger (Odontaspis ferox) and the extremely rare big-eye sand tiger (Odontaspis noronhai). So it appears that there are three different species of sand tigers. Notice however that genetic markers suggest that the two Odontaspis species could be more closely related to sharks belonging to other families of Lamniformes, like the tresher shark (Alopius vulpinus) or even the crocodile shark (Pseudocarcharias kamoharai). Perhaps Odontaspis and Carcharias are the result of convergent evolution, meaning a process by which unrelated or distantly related organisms evolved similar body forms, coloration, organs, and adaptations. Anatomy The sand tiger shark has a flattened, cone-shaped snout and a distinctive, oblong tail with a notched, upper lobe that is significantly longer than the lobe below. Individuals range in size from 6.5 to 10.5 feet in length. It usually swims with its mouth open displaying three rows of protruding, smooth-edged, sharp-pointed teeth. Adults tend to have reddish-brown spots scattered mostly on the hind part of the body. Its jagged protruding teeth certainly give the sand tiger a ferocious look: the sharp teeth seem to protrude in all directions, even when the mouth is shut. But looks can be deceiving, because sand tigers are a docile, non-aggressive species known to attack humans only when bothered first. They are also one of the few sharks that are tolerant of aquarium life. Habitat and Behavior Sandtiger encounters are common occurrences in shallow offshore waters. Ship wrecks are one of their favorite habitats, probably because of the massive schools of small bait fish. Along the coast of North Carolina sandtiger sharks congregate in numbers of more than one hundred in the shipwrecks lining the coast, many dating from World War II battles (see insert above). At the wrecks they can be seen swimming through dense schools of small fish (‘bait balls). The abundance of food obviates baiting by humans and allows UW photographers to close in to the sharks when they glide their way through the bait balls. Sandtigers are the only shark known to come to the surface and gulp air. They store the air in their stomachs, which allows them to float motionless in the water, seeking prey. When feeding at night they become voracious predators, that generally stay close to the bottom. Their prey is small fish, but they will eat crustaceans and squid as well. They occasionally hunt in groups, and have even been known to attack full fishing nets. During the day they are found near caves and ledges, hovering just above the surface either singly or in small groups. In these conditions the sand tiger is a relatively placid and slow-moving shark that will not cause any danger to humans. In fact the database of Shark Attack Survivors does not list any fatalities due to sandtiger sharks. Survival. Two factors have made the survival status of the sandtiger critical. First, the slow-moving, approachable sandtiger with a tendency to aggregate in large groups has been an easy target for spearfishers for years. In waters of New South Wales and southern Queensland in Australia the numbers of sandtigers have declined dramatically throughout the 1960s and 1970s, due to the combined effects of targeted spearfishing, incidental capture by commercial and recreational fishing and beach protective shark meshing. Although the species have now become protected, accidental bycatch still occurs. A second factor is their low reproduction rate. Female sandtigers are ovoviparous and only develop two embryos, one in each uterus. The young embryos then feed on their mother eggs until only one pup is left in each uterus. Females don’t reach reproductive age until they’re nearly 10 years old, and then only produce one or two pups per litter every two years. Over nine months to a year, the pups grow within their mother feeding on hundreds to thousands of eggs and, by the time they are born, measure up to a meter long.